This is a hand painted ceramic marble by Gregg Pessman. 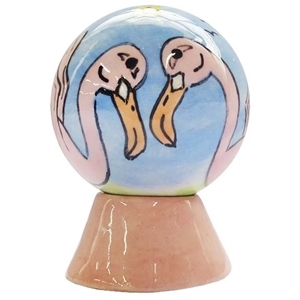 This marble features two pink flamingos out on the lawn with a boom box playing music. The scene wraps around the marble. Sits on a flamingo pink matching stand. Measures approximately 1 1/2" shy in diameter. Signed and dated by the artist.